With 3600 PSI and a high quality, rebuildable triplex pump, the DR PRO XL is a serious professional cleaning tool. A cart-style frame and big pneumatic tires make it easy to transport over the most rugged terrain. Built for the rigors of everyday use, the PRO XL3600 is designed for the most challenging applications, and with ease of maintenance in mind for the professional user. It’s perfect for cleaning heavy equipment, brick and concrete surfaces and typical homeowner applications like siding and decks. The rugged, low-profile cart and big pneumatic tires, make it compact and easy to maneuver around a jobsite (or roll on or off a trailer). Our hose is flexible and easy to manage, even under pressure, so you don’t need to wrestle it. Abrasion resistant. Our OHV engine is easy-starting and provides plenty of power to drive the pump at full capacity. 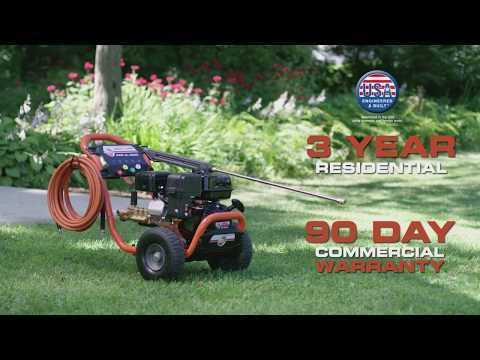 The horizontal shaft design is ideal for pressure washers because it positions the pump for easy access to connections (instead of placing them very close to the ground as vertical shaft engines do). Automatic low oil shutdown prevents accidental damage. 49 state and Canada CARB approved. With features like ceramic-coated pistons, the triplex pump is designed for rugged duty and long life. Rebuildable. Have used it about 10 hours. Have been very favorably impressed. It is more powerful than those I have owned in the past and it is very effective on VERY tough jobs. We are extremely pleased with the washer. The hook up/connections are what drew our attention in the catalog. The only thing we have not tried is the soap part because we are not exactly sure how it works. We have always been pleased with anything we have purchased from DR. This pressure washer is a very aggressive cleaner! The high PSI and GPM blast away dirt and grime with ease. The included gun is also very comfortable to use and is quick to connect and disconnect from the unit.